There are several ways to check if the soap is lye heavy. Before testing, wait five days. During the first two days, the lye is reacting with the oils and turning into soap. Most of the saponification process happens within those first two days. Allowing the soap to sit a couple extra days will ensure that process is complete and the results are accurate. The first test – the “zap test” – is nice and simple. It involves tapping the soap lightly on your tongue. It sounds weird, but it totally works. If it “zaps” you, it is likely lye heavy. The zap is hard to describe, but you will know it when you feel it. Do not the zap test if the soap is seeping, as the liquid may be unsaponified lye that can burn your tongue. If the soap doesn’t zap you, it is likely safe to use. You can use other methods to be sure though. Did you know that red cabbage is an effective pH indicator? 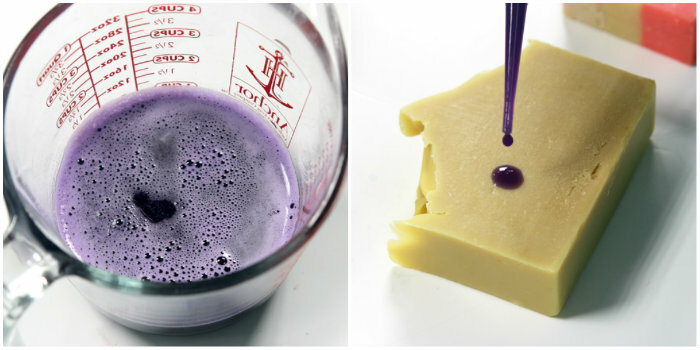 You can puree red cabbage with distilled water and drop the juice on the soap. If the soap is lye heavy, the soap will turn green or yellow. If it’s balanced, it will turn blue. Read more about using cabbage juice in this post. Cabbage juice can be used to test the pH level of soap. Learn how in this post. pH Strips are another way to see if the soap is lye heavy. To use them, wet the soap with water and rub your hands on it to form bubbles. Insert the test strip in the lather. Then, compare the color on the strip to the chart on the packaging. Normal soap pH is around 9-10. If the soap is 9-10 it will turn light green. If the soap is pH 11-14, it is lye heavy. The pH strip will turn a dark green or purple in that case. Normal soap pH is around 9-10. NOTE: This chart does not represent the colors on a pH strip. Don’t throw out your lye heavy soap! If the soap is slightly lye heavy (11-12 pH), it makes great laundry soap. Laundry soap is a combination of shredded soap and ingredients like baking soda and washing soda. The combination helps clean and deodorize dirty clothes. If the soap has a pH of 13-14, it may be a bit too harsh for delicates and works better for dirty rags, towels, etc. This post has three laundry soap options. 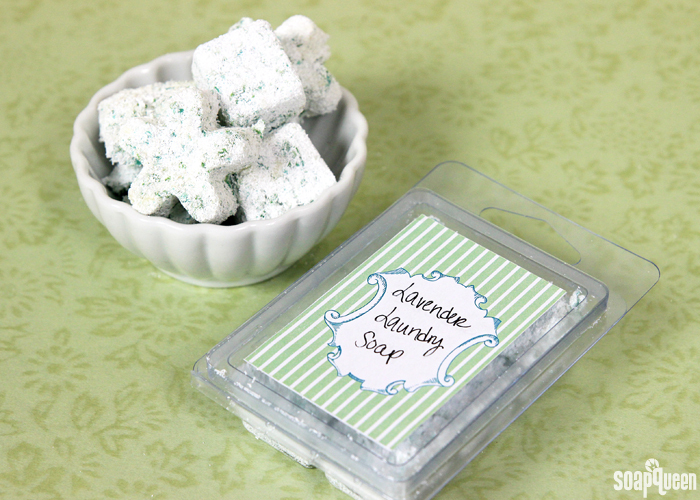 The Natural Laundry Soap Recipe is made with soap, washing soda and citric acid. The post also features a recipe for natural dryer sheets made with white vinegar, lemon essential oil and lavender 40/42 essential oil. Lye heavy recipes can be used to make laundry soap. In certain cases, the soap may have pockets of lye. That typically happens when the soap separates. In that case, I recommend throwing the batch out to be extra safe. The lye pockets can irritate or burn the skin, or may do some odd things in the laundry. If your soap is lye heavy and you would prefer to throw it out, handle with care. I would recommend wearing gloves when handling it, and double bagging it before throwing it out. If you’re considered with disposing of the soap, contact your local hazardous waste collection department. If the soap is 9-10 pH, it is safe to use on the skin. You may find the soap is 9-10 even if you forgot an oil. Along with adding a luxurious feeling to the soap, the superfat level can also act as insurance. For instance, if you forgot castor oil at 2%, a superfat level of 5% will cover that loss and the soap will still be balanced. Who doesn’t love a soapy backup plan? If the soap is dry but not lye heavy, there may be something else going on. 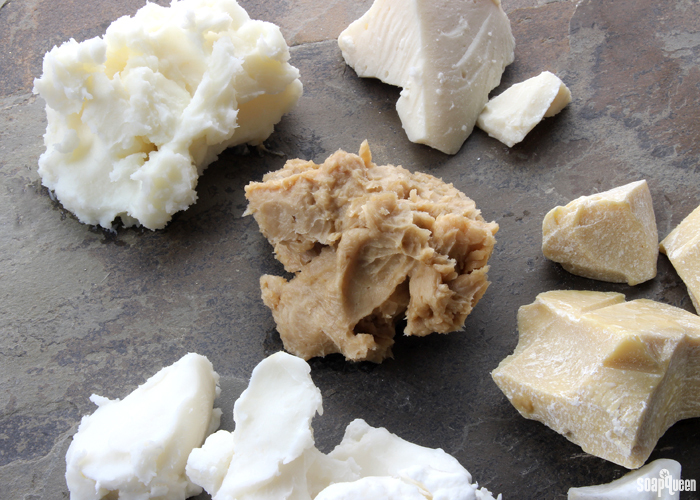 For instance, a high amount of butters in the recipe can make the soap firm or brittle. We recommend using them around 10-15% or less in the batch. Learn more in the All About Butters post. Too much sodium lactate can make the soap brittle as well. Sodium lactate is a liquid salt that helps the soap unmold more quickly. The usage rate is 1 teaspoon per pound of oils. If more than that is used, the soap may be a bit brittle. This post has more information on sodium lactate. A high percentage of butters can create hard bars. We recommend using them at 10-15% or less in your recipe. Temperature can also affect the feel of the soap. If the soap gets really hot, it can crack, volcano, or form an odd texture called “alien brains.” It can also result in hard soap. Read more about how temperature affects soap here. To keep the soap cool, you can pop it in the fridge or freezer for 5-24 hours. This is recommended when using sugary additives like honey or fruit puree. 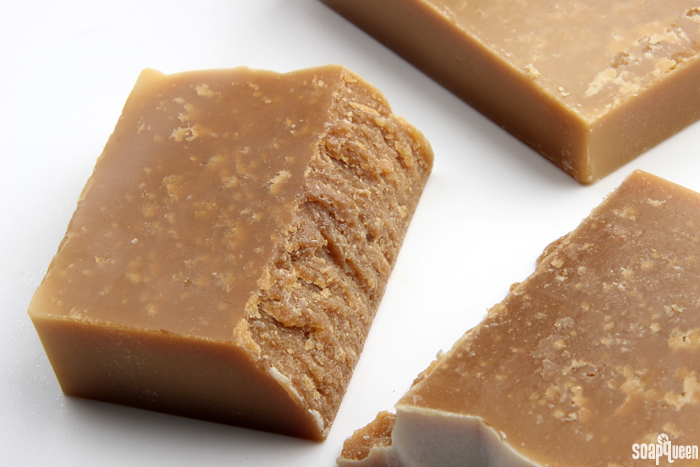 The Adding Honey to Cold Process Soap post has more information on how to prevent overheating. This honey soap overheated and created a hard, dry bar. If the soap is a bit too dry for your preference, it can be used as laundry soap. You can also rebatch the soap with equal or double parts of a soft recipe. Learn how to rebatch soap here. That will help balance the recipe and make it a bit softer. The Castile Rebatch is a great option because it’s soft and gentle on the skin. If your batch separated but is not lye heavy, another option is the Hot Process Hero Method. It works for batches that have separated, seized, etc. The method involves pouring the batch into a stainless steel pot, stick blending it and heating it on the stove. That helps emulsify the soap fully. It works best within 24 hours, so if you see your batch separating the next day, give this method a try. The method helped emulsify this Black Cherry soap after it separated. The Hot Process Hero Method saved the Black Cherry Soap. 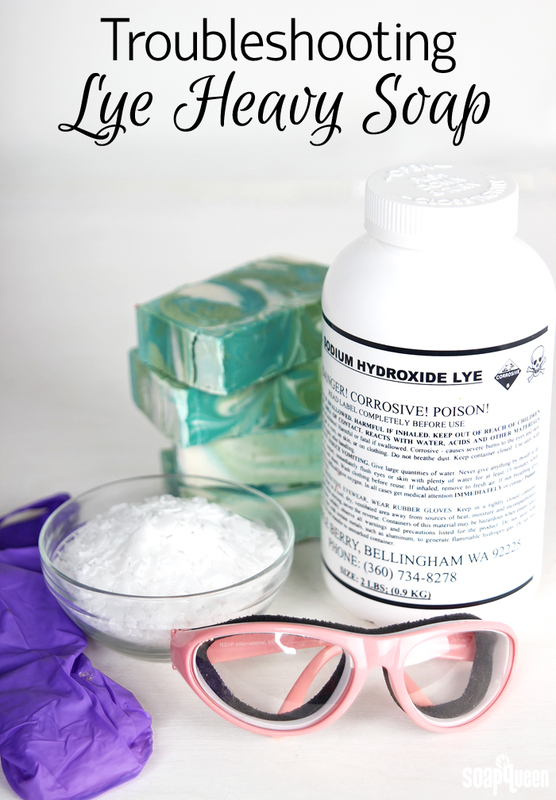 Do you have any tips or tricks for dealing with lye heavy soap? It can be discouraging to find out your batch of soap is lye heavy, but it happens to all of us on occasion! When pouring each oil for my recipe, I always cross it off my list to help ensure I don’t forget an oil. What are your tricks for creating a balanced bar each time? 700ml of mixed vco , shea n coca butter. When your recipe is all hard oils the soap can crack. You’ll want to pH test it using one of the methods listed above just to be safe. If it’s 9-10 pH you can use the bars. For your next recipe you can try adding liquid oil like olive, sweet almond, avocado, etc. That will make the bars softer and less likely to crack. Hi, I made soap following all the directions given by your site. Everything went well so far, I didn’t cut it yet I placed it in the freezer to prevent the gel phase. But my problem is when I added the mica colors on light trace all the colors changed to darker hue. Like the bright blue turned greenish blue And the purple disapeared😕 even the white didn’t work well. What recipe were you using? If the soap is very yellow because of something like olive oil, it can affect the colors you add. I made a cp soap yesterday and upon unmolding it i noticed several tiny white spots. What happened? i decided to try lye/ water and coconut milk? the coconut milk was in ice cubes. so the lye water solution didn’t get very hot. I added a bit of salt cause i was concerned it would be soft cause of the coconut milk. Can still use this soap? It was for a fundraiser for my friend who got beast cancer. So i’m not really profiting on this soap, but i don’t want to loose since i’m investing so much. This is the first batch and it was small at 12 bars but i need to make more and don’t want this to happen again. Crazy thing is i’ve made this before with and either full coconut milk or water not both. With half the lye, the soap will be really soft. It may not be fully solid. How long ago did you make it, and how is it looking now? I can offer some tips to try, like rebatching with more hard soap. I’m wondering if it’s soda ash. The good news is soda ash is just aesthetic and doesn’t affect the final bars. You can also steam or wash it off. I made my first cp last night. I was so fun to be successful at it! But today when I went to take it out of its mold.. after 5 minutes I noticed a red/pink tint started to develope all around the soap. Even the parchment paper where I had peeled away from the soap had This tint. What is it? I’m not sure why that happened. Is the mold you’re using red, or did it have any color residue? What scent are you using? Certain ones can cause discoloration. Hello! It isn’t clear to me the soonest time I can tongue zap test my soap to see if it is lye heavy. 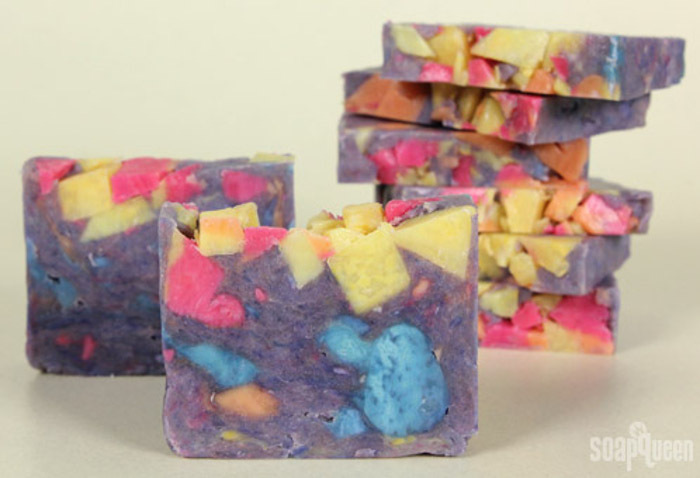 i made the soap today–can I do it today or do I need to wait? Ahhhh…just read another comment! I’ll wait five days! Yep, that’s correct – 5 days is a good time to test. I made a coffee coloured soap a week ago. I also experimented using some snakeskin in the lye water and left it for 5 hours. My problem is yesterday I did a zap test and both my partner and I agreed we felt it…yet this morning I’ve lathered up a bar and used a pH test strip and it’s definitely between 9-10. Because this bar was 100% coconut oil I used individual molds. Is it possible some bars may not have been as well mixed? Somewhere I do have an electronic pH tester but still….any ideas. That soap will still zap during the first few days because the lye is still active. We recommend waiting 5 days and testing it again, that should give you a more accurate reading. I added stearic acid in my cold process soap at light trace because I forgot to add it in my lye water. I stirred well, but in the finish product I can still see the specks of white. Is it safe to use? Stearic acid has a high melting point, so if your temperatures were lower than 150-160F it may have solidified in the soap and caused those specks. To be sure, you’ll want to pH test the soap with the methods listed above. As long as it’s around 9-10 pH, it’s likely clumps of stearic acid and will be safe to use. I am fairly new to soap making and with my new scale apparently mismeasured the amount of lye/green tea solution I was using for my last soap batch. I now have lye/green tea solution left over. Am I able to use it later? How long can I store it? How can I increase the temperature back to 100F? You can use the lye and green tea solution later. You’ll want to cover it with a lid or plastic wrap and store it in a safe place where it won’t be touched or spilled. As for the heating, you may try placing the container in a hot water bath to increase the temperature a bit. We’ve noticed when we stored lye sometimes it can get spots on the top. We’re not entirely sure what they are, but you can pour your lye through a strainer to catch them just in case. I just made my first batch of CP olive oil and coconut oil soap. It’s still in the mold. Won’t be ready to cut until this afternoon around 3. But my question is: Is it necessary to let the soap cure for the full 4 to 6 weeks. I have read before that it could be ready to use within 2 days as the soponification has already almost completed and that the cure time is to make the bar of soap more firm. I am asking this because I am new to CP soap making and am excited to start using my soap. Thank y’all so much for all your help and information. It’s all appreciated as I begin my soap making journey. Technically the soap is ready to use after about 5 days. However, curing it gives you the best results. During the 4-6 weeks excess water evaporates, which means the soap is harder, gentler, and will last longer in the shower. Hi I am relatively new to soapmaking. Made a few batches of simple olive oil soap and it turned out fine. I decided to try out some herbs from my garden and put dried mint in one loaf. After 3 days I tested the soap with cabbage and the whole batch was fine except the one with the mint which turned out yellow. Touched it with my fingers and it stung and even bled a little. Could the mint somehow extract the lye out of the thing? Thanks for a superb site and articles. We haven’t worked with mint a lot, but I have seen people use it in batches so I’m not sure why that’s happening. I think instead it may be lye heavy or separating. Do you see any pools of liquid? How long did you stick blend? Let me know and I’ll help you troubleshoot. I tested the soaps I made from the rest of the same batch, both with the ph strips and the cabbage test and everything was fine ( around 10). No separation or pools of anything. I think maybe I blended too long since some of the bars are really hard after only 3 weeks. The bars with the mint are testing at 10 pH? Are they still stinging your fingers? can use 15 % shea butter and the rest coconut oil 85% ..? will that make moisturising bar or good for dry skin ?? And how many days we require to cure the 100% coconut oil soap ? You can use 15% shea and 85% coconut oil, but you’ll want to do a high superfat because coconut oil can be drying when used at more than 30%. I would recommend at least a 10% superfat, up to 20%. Hai,, how many days to cure 90% virgin oil and 10% coconut oil soap? 0% superfat. That will need to cure for about 4-6 weeks. Because it has a lot of coconut oil and no superfat, it will likely be closer to just 4 weeks. I have been making CP soap for several years, buying the stock from the one supplier (Aussie soap supplies – your affiliate in Australia) without issue. I recently bought sustainable palm oil from another supplier and have nothing but trouble. I use brambleberry lye calculator (as I have for years without issue) and since using this new palm I started to get spots of what were white lye spots, like the sodium hydroxide is gravitating to stearic spots in the soap? I stopped 10% water discount and soaped at a cooler temp (37deg c) so slow down acceleration and this has stopped the white spots appearing within the bar but now I am getting white bigger concentrations of “lye spots” in the corners of the soap. I have made about 20 batches with this palm and all result the same, and I made a palm free batch and got no such issue, so it’s definitely an issue with the palm oil. The supplier gave me a new box and still the same issue! Have you ever heard of lye reacting badly with palm? Also, if I superfat at 5% and know my scales are perfect then is it possible to still have a lye heavy soap? I didn’t think this was possible but I cannot understand why I have these concentration chalky pockets appearing? I am about to make another test batch but I will increase superfat to 10%! And I will emulsify to a thick trace to rule out any non traced lye water. But I always bring my soap batter to a custard trace with lines appearing on top when tested. I would also recommend contacting the manufacturer to find out more. They may have tips for working with the palm oil. Maybe you could try soaping at a higher temp? If a soap shows PH 7-8 on a test strip, but there was zero superfat in the recipe. Could it still be lye heavy or safe to use on the skin? If the soap was lye heavy, it would be pH 11 or above. Your bars are actually a bit more gentle because they have a lower pH than the usual 9-10. They should be just fine to use on the skin. I have a recent batch (made with pumpkin spice FO) that seems to be seeping oils. I mixed my TD with hot water instead of oil because I’ve been having such problems with drag marks, and the white swirls of the soap separated, almost looks like ricing. The orange and brown swirls look just fine, but the whole soap is seeping some oil. Any ideas on what could have gone wrong? I read that the fragrance could accelerate and it certainly did, but I’ve never dealt with the oil seeping before. The TD I guess I’ll just go back to oil, I can’t seem to get it totally broken up though with a milk frother! Usually seeping oils from a soap don’t have anything to do with Titanium Dioxide. It is usually the result of the fragrance not being mixed in thoroughly. Since the fragrance is added in at the end – it’s easy to undermix it in your excitement to get it into the mold. That makes total sense, thank you Amber. To salvage this batch (it’s 3 days old) should I try to rebatch? You might just dab off the oil and let it dry out – then test the pH. It could just be an aesthetic thing and perfectly safe to use. In which case you could chop it up and use as embeds – or maybe you will find you like it the way it is. Hello! My soap separated and has lye pockets… Any way to salvage it? Can I do the re-batch method? I would prefer not to throw it out. If your soap has lye pockets, we recommend throwing the batch out to be extra safe. The lye pockets can irritate or burn the skin, or may do some odd things in the laundry. If your soap is lye heavy and you would prefer to throw it out, handle with care. We recommend wearing gloves when handling it, and double bagging it before throwing it out. If you’re considered with disposing of the soap, contact your local hazardous waste collection department. Hi. Quick question. Is it possible to use lemon just instead of citric acid to bring down the ph of soap from 14? I made it to lye heavy. I did the soap using hot process. I did use a ph stick. :). It has only been 2 days though. Thanks for the help. Once the lye starts turning the oils into soap, adding lemon juice won’t help lower the pH. However, the lye is still pretty active during the first few days, so I’d recommend pH testing again in three days or so. If it’s still high, you can use it as laundry soap. I recently made a batch of goats milk and activated charcoal cold process soap. I soaped at a low temperature so I didn’t burn the milk, poured it in the silicone mold and popped in the freezer. It unmolded perfectly. It’s been curing for two weeks now and when I went to rotate the bars, I noticed that each of the bars had a few crystals pushing through the surface of the bar. It almost looks like little salt crystals. Could this be undissolved lye? I stirred and stirred the lye and milk, but maybe I missed some? I cut a bar in half just to see if there were any lye pockets and there’s no crystals. The soap is just a little soft inside because it hasn’t set long enough. Hmm, I’m worried those may be flakes of lye. I would recommend using a pH strip to test those spots. Don’t do the zap test – if it is lye, it may burn you. Let me know what the pH strip says and we can troubleshoot from there. Thank you for getting back to me so quickly. I pH tested the lather and got a 9. When I put a drop of water on the spot, I got a 10/11. So I’m thinking it’s definitely lye! Any ideas on what to do with the soap? I don’t think it would work well for laundry detergent because it has activated charcoal in it! I made another small batch of goats milk with colloidal oatmeal in it. It’s been out of the mold for about a week now, and I can feel what was really smooth sides starting to have little bumps on it. I’m afraid it is undissolved lye pushing its way to the surface again–I thought on each batch I had completely dissolved the lye! I’ve not been using a water discount and have been sticking with twice the amount of milk as lye (2:1 milk to lye). Any thoughts on ways to make sure this doesn’t happen again? I think I’m going to try dissolving the lye in water (half of the water amount) and then adding the milk at trace. I’d love to have milk for the full water amount, but I must not be ready for that yet! Thanks so much for your help and support! I really love Brambleberry products and this blog is so helpful! The 9-10 pH is fairly normal, and usually lye spots test a bit higher than 11. Can you send me a picture of the charcoal soap and the goat milk soap on Facebook? That really helps. I accidentally doubled the amount of olive oil and quadrupled the amount of water and lye making the soap with too much lye. I quickly noticed this after I had poured into molds. I removed all the soap from the mold, added more olive oil and remixed. I then repoured into the molds. I’m hoping I didn’t ruin a batch. Any ideas on what I can do to test and remedy if needed? Thanks for your article! I made a batch of soap with 10 oz. Coconut Oil, 40 oz. Olive Oil, and used 6.8 oz. of Lye. After 72 hours, I removed the bars from the mold to cure and noticed the ends of my fingers stung a little bit and was wondering if this may be because the soap is either lye heavy or needs to saponify for a few more days. Any input is appreciated – thanks!! This might be a silly question but…. when is the best time to test with the PH strips…. meaning how long into the curing process? I have a question re: ph readings – looks like a soap I made tests closer to 8 according to the ph strips I have – would this just be a milder soap? I have a question about soap that seems lye heavy only on the top. I made a five-pound batch with a recipe I use often at a small batch. The only things that were different this time were (1) the size of the batch (I checked and double checked the water and lye in Soap Calc and on Brambleberry), (2) I used a combination of Grapefruit Bellinni and Grapefruit Essential Oil as my scents and used the Brambleberry fragrance calculator and the Soap Maker 3 calculator for the amount, and kept it on the “light” side since I hadn’t used the EO before, (3) the lye and oils were cooler than I usually use. My oils were at 117 and my lye at 90. I mixed the batch in a large stainless steep pot and it came to trace in the normal amount of time. I wanted to pile it up a bit so I took it to medium trace, put in the scents, and then took it to a heavier trace. I did notice at the time that the fragrance oil and essential oil were difficult to blend in but they did eventually do so. It poured great and I scraped every last drop on top, waited for it to set up and then made some high peaks. I unmolded the next evening and it was a nice hardness BUT there were three spots where there were definite oil “shines” that I could run my finger across and tell it was oils. I cut off an end and used phenothaline and in the middle of the bar it was fine. However, when I tested on the top (where there was some white – but no crystals – and it tested a definite dark pink. Could the soap that I was pulling from the sides of the steel pan have not been fully emulsified and more caustic? I tested by washing my hands with the soap and it was perfectly fine. I haven’t done a zap or the cabbage test but plan to this evening. I can turn all this into laundry soap but oh my I hate to use this big batch of pretty soap. Do you think I should cut it into bars and see how it looks all the way through and test more of the bars? I could kick myself for straying from my regular pattern of having the oil and lye at around 120-130. But I don’t have much experience yet with 5 pound batches, so I am also concerned that, even though it seemed at a good solid trace that somehow I didn’t work down the sides into the batch enough before pouring. Any thoughts appreciated. I know you can’t really know without seeing it – I’m just asking for your best guess with your many years of experience. Thank you!!! I will try the strips and cabbage and let you know. Fingers crossed! Thank you, thank you, thank you! No zapp, pH strip at 10, and cabbage test a beautiful and definite blue!!! The next slice was equally lovely on my hands so I feel confident it will just improve with cure time. Thank you! I guess because it seems so “scientific” I never would have guessed the drops! I am going back to cabbage and pH strips! Thanks again!!! I have a soap I made to compliment the Cocoa Butter Cashmere Mousse, however it never seemed to PH balance. I just zapped tested it and no zap. I have been using the Phenolphthalein Sodium drops to test my ph balance. It turns completely pink. I am thinking my recipe might be the problem…I use the SoapCal but just ran it through SQ’s too. not a big difference. 5% superfat…which I probably didn’t need. My question is, would the high content of Cocoa Butter not completely saponify??? I am at a loss since it doesn’t zap and is likely not lye heavy?? Could I try to rebatch? What else can cause a heavy lye soap? Other than measuring incorrectly. I have tripled checked the lye calculator to my recipe and I have checked measurements but the same recipe and another one came out lye heavy more than once? Perhaps I am not mixing it enough? It seems to be getting to trace and doesn’t seem to be a false trace. Thanks for your help! Thanks, Kelsey. My scale just broke so I wonder if that had something to do with it! Hi,Is it possible for a sodium hydroxide solution not to get warm/hot? After adding the sodium hydroxide to my distilled water, nothing happened. So far it seemed to work when combined with oils. But my soap is busy curing, so I have no way of knowing at the moment. Confused. Thanks! I am having the same problem. I use frozen goat’s milk for my lye solution and it NEVER gets above 69 degrees. This is even with FRESH unopened lye! I have even quit using an ice bath because of this and use a warm water bath to raise the lye temp. I don’t have much counter space and I have a freezer at the end of one of them. I always measure each oil or butter separately, then add to larger container to stick blend. Stainless steel only. I know the weight of my containers empty just in case, crossing off each ingredient as I go. I dont mind washing dishes. I forgot Shea butter oil today (18%). It wasn’t until I was putting away the ingredients that I realized I had done this. Does this mean for sure it will be lye heavy? Can I rebatch and add the Shea butter? I have been wondering on the precision of measurements. sometimes when measuring the oils a little more will “plop” out at the very end and I will end up with say .2 or .4 oz over the weight i was going for. with the first oil no biggie, but when its the 3rd or 4th you can’t really “remove” it. How much does this really effect the end product? So far I have not had adverse reactions but was wondering if there was an acceptable variance? To clarify, when you test with pH strips, you’re supposed to use Distilled water, right? Because faucet water can mess up the pH? Hi! I didn’t know where to post my question; it’s a bit off topic, but here goes. I’m new to soapmaking, and though I’d like to start with melt-and-pour bases, I would like to eventually graduate to cold-process. Unfortunately, I find the curing time for the latter — at least 2 to 4 weeks — a bit impractical for my purposes. Is there any way to speed up the curing time for cold-process soaps? Thank you, Juliette, for your very helpful response! I guess I’m so focused on doing things perfectly that I’m not allowing myself to personalize procedures, to really make my nascent soapmaking experience truly mine. Yes, there is such as the Water discount method. But , I think it would be better to get a few batches under your belt before you try it. Just to be safe! You needn’t worry, Anna. As worried as I am about making mistakes, I’ll definitely do some “practice batches” first. It’s all about gaining confidence, I suppose. Phew, girl! Thank you for all your advice. I’m bookmarking everything, shopping, deciding, and preparing. I hope to have good news to share soon.